Some of us had a hot weekend. Some of us had a cold weekend. Some of us have been suffering through the wettest weekend of our lives. No matter how inclement your weekend was, just remember… it still beats Monday! Ivy and I went up to Braddock Bay, where some raptors lurk even in fall. However, the bird I was most surprised by was a Warbling Vireo that perched out in the open long enough for my young daughter to get a decent look. Corey’s Best Bird of the Weekend was not an easy choice. Not because he saw lots of really rare or unexpected species but because he saw quite a few common birds and sometimes it’s difficult to decide which of the common species to choose from the flock. 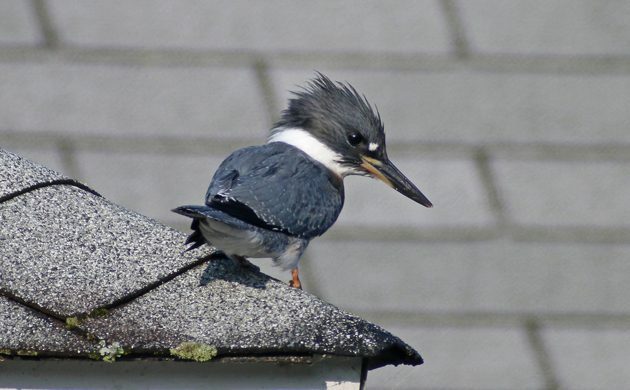 In this case, he chose a Belted Kingfisher at the Saugerties Reservoir which he digiscoped while he was back home visiting his folks. Kingfishers are always fun to watch! Do Irrupting Snowy Owls Survive?